I’m excited to be teaching this one week workshop in the fall. It is based on the types of treatments for leather bookbindings that I use most in my own book conservation business. Emory University, the site host, has a board slotting machine which participants will be able to try out. Atlanta is a hopping city, inexpensive to fly to, great food, and the weather is usually pleasant in early November. I will also be giving a lecture on the history of book boxes Friday November 2, if you want to spend the weekend. Please join us! Sponsored by the Southeast Regional Conservation Association. In this week-long intensive workshop, students will be introduced to a wide variety of current techniques used to conserve leather bookbindings. Bookbinders, technicians, and conservators who wish to learn, expand, or refresh their treatment skills are all welcome. 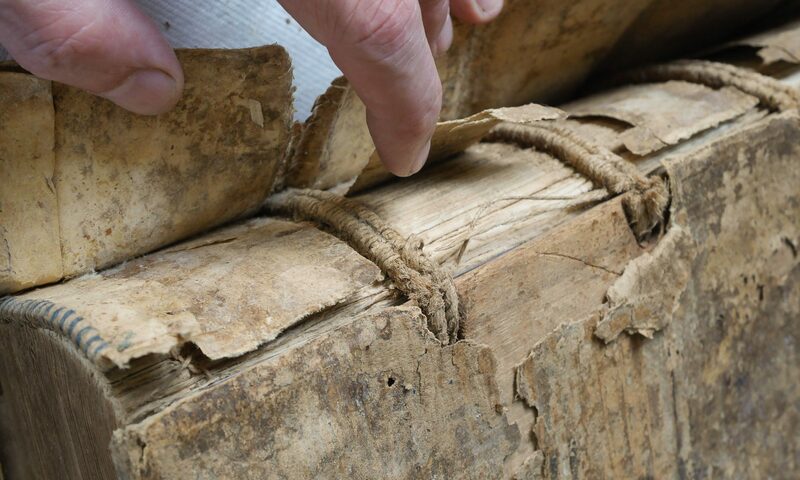 Previous bookbinding or conservation experience is required. Detached boards are the most common place leather bookbindings fail, and all five primary methods of treating this will be taught: mechanical sewing extensions and tacketing, inner hinge repairs, interior-board repairs (both splitting and slotting), outer joint repairs, and several styles of rebacking. Many treatments involve a combination of these techniques. Questions concerning methods of consolidating older leather, the archival qualities of modern leather, and leather dyes will be discussed. A variety of methods to pare, consolidate, and lift leather will be introduced. Since a sharp knife is crucial to success in any leather work, sharpening will also be taught. Students should bring six to eight non-valuable leather bound books to work on, though there will be additional books provided to practice with. 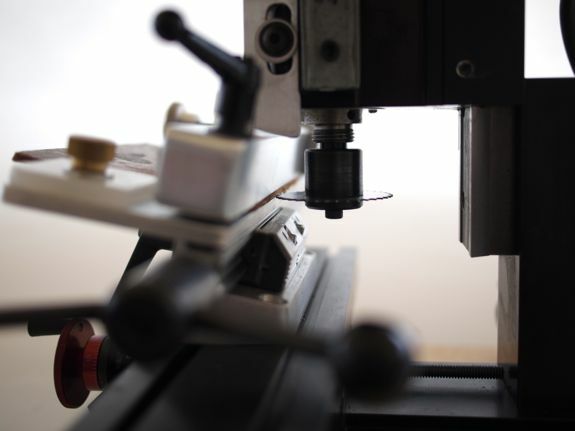 Participants will be taught how to pare leather with a knife, use a board slotting machine, a modified 151 spokeshave, a variety of lifting knives and tools, and a double edge razor blade paring machine. There will be individual consultations with students before the workshop to discuss treatment goals for their chosen books, and determine if extra materials or tools might be required. Decision making based on the actual books will be discussed. The primary goal of this workshop is to equip participants with a more nuanced understanding of the pros and cons of currently practiced leather conservation techniques, gain supervised experience while performing them, and feedback when they are completed. Application: Registration is limited. Participant selections will be made by the SERCA Board of Directors via the following order: SERCA members (new or renewing), practicing conservators in the Southeast, and other qualified applicants. Applications are due Friday September 14th, 2018. Cost: $900 for existing SERCA members, $925 (including $25.00 SERCA annual membership fee https://sercaconservation.org/membership/) for new and renewing SERCA members. Payment taken after review of applications. Board slotting is likely the strongest and least invasive method of treating detached boards. Detached boards are the most common point where bookbindings fail. Christopher Clarkson developed the technique in the late 1970’s. The board slotting tab at the top of this page and the board slotting blog offers more information concerning its history, technique and recent advances. The original Peachey Board Slotting Machine, developed in 2005, is used in conservation labs around the world. It is, however, a somewhat large and expensive machine, and best suited for large institutions. The Manual Peachey Board Slotting Machine is a new affordable alternative for individuals, regional centers, smaller institutional labs and even larger labs with space limitations. This smaller machine can be moved out of the way when not in use, freeing up valuable bench space. It is also simpler to operate. 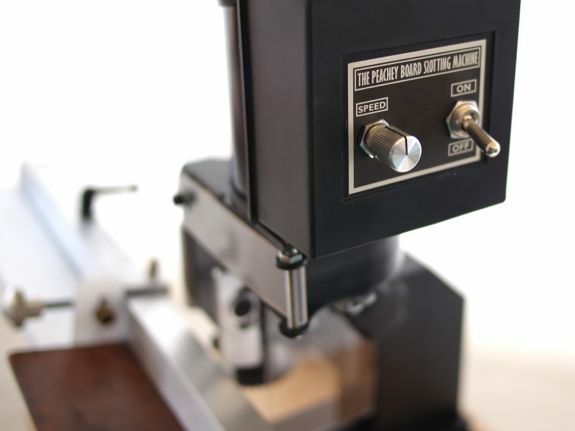 The Manual Peachey Board Slotting Machine features stops that automatically guide the positioning of the blade when starting and stopping a cut. 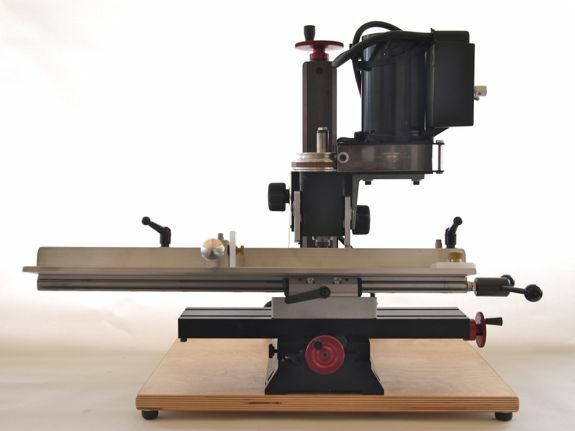 In order to make this machine more affordable, three aspects are limited as compared with the original machine: the maximum length that can be slotted is 15″ (rather than 17.75″), the board needs to be manually pulled or cranked using a hand wheel, and the angles for slotting are not infinitely adjustable, but can be set at 11, 13, and 15 degrees. These are the most common angles used. In fact, I use 13 degrees about 90% of the time, 11 for very thin boards, and 15 for thick ones. This machine is less intimidating when compared to the original. The orientation makes it easier to sight the height of the blade. The carriage can be quickly pulled back into starting position after the end of a previous cut. This also makes partial (or biscut) slotting of a board very fast and easy. Overall, the slotting operation seems to be quicker. Many bookbinding and conservation students, such as those from North Bennett Street School, have been trained in the fundamentals of board slotting. A one to three day workshop on machine operation, basic slotting technique and structures is recommended, though. -Weight 30 lbs. Easy to move and store when not needed. -The sliding board carriage can be quickly moved to the starting position at the end of a slot, or between biscuit slots. -Dust collector hooks up to a standard vacuum cleaner. -Thick and thin solid carbide blades included for long cutting life. 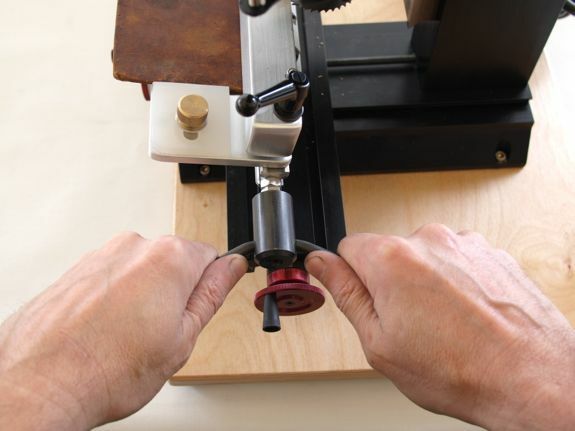 -Automatic blade positioning for starting and stopping a cut. -Boards can be slotted by pulling or cranking. -Safety guards (not pictured) keep hands away from the blade in use. -The motor, and other operations are similar to the original machine. -No electrical transformer needed for international operation, just plug adaptors. -This machine can be shipped pre-aligned, but still needs some assembly. I have a machine in operation at my NYC studio if you would like to examine and give it a test drive. Please contact me if you have questions or need a formal price quote including shipping, assembly and training.